Born in 1835, Washington S. Tyler was one of Cleveland's most successful businessmen and founder of the Tyler Company, a pioneer in the introduction of wire specialties. 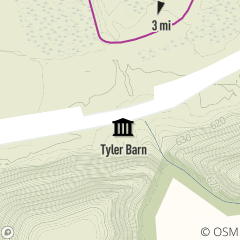 Tyler Barn was part of the family summer residence, known as Woodside, a country estate overlooking the Rocky River Valley. In 1921, a 75-acre parcel was donated to Cleveland Metroparks to help establish the Park District.